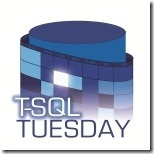 TSQL Tuesday #60 – Something new learned.. This TSQL Tuesday is hosted by my good friend Chris Yates – the topic is on something new learned in the recent past. It is a simple topic but can sometimes be hard to articulate. I am a big believer in an open mind and learning anything new that comes my way – and have learned that the older you grow the harder this can be. The one practical lesson I claim to have learned, finally, in the recent past – is to sell myself and my work better. Or..to put it in other words, that publicity for what you learn and do is as important as the work itself. I grew up in a culture that did not think too well of people – in particular women, being very extroverted. That combined with the fact that I was home-schooled for health reasons did not make me a huge extrovert by nature. My good friend Kevin Kline once did a survey of geeks and explained that most people who take to computers in a big way are, in some ways introverted. I don’t think being introverted has anything to do with self esteem, or even being shy or anti social. I just think these are preferences around how we are – that we prefer quality company over numbers, and are somewhat deliberate in our thoughts and actions. I do think though that it does impact how we sell ourselves – or publicise our work. For someone to know you you need to get out there and show them who you are – or it is more likely that those people who know far less than you do and drum up their work better will get the right chances to get ahead. In my 13 years of attending the PASS Summit – I have always tried to spend time in classes, attending the occasional evening party. This time, I did something different. I spent most of my time networking – hanging out in community zone, asking people if they’d like to do lunches or dinners where we shared each other’s cares and concerns, and introducing myself to many SQL celebrities I had only known by name. I found the experience very rewarding – I got a lot of insight into options for career advancement, upcoming trends and changes in nature of work (more telecommute, more data analytics, more ‘unlimited’ vacation…) – not to mention the emotional support from a huge number of #sqlhugs. I was selective, of course – in some ways, like I have always been. I usually hang with people whom I feel are genuine at some level, not just all about fluff, and are intuitively easy to relate to. That is something that I will want to keep. My good friend Grant Fritchey once remarked to someone who was a very strong techie and yet very humble and unassuming – ‘you need to be more assuming’ (he meant that you need to sell yourself more/better). That , in one sentence has been what I learnt recently – to be more ‘assuming’ while being true and genuine, at the same time. Humbled and honored that I could be at all helpful. Thank you! Thanks for participating Mala and even more appreciative to be called friend; great post. Roundup coming in the next few days.